Anyone new to Yacht shipping might wonder why they should consider shipping the vessel by sea. While we know many of our sailing friends would prefer to take to the oceans themselves, there are plenty of situations when sending a vessel by transport is a great idea. In this article, we will explore some of these reasons, but first, here is a little about what United Yacht Transport does. As a leader in the yacht shipping industry, United Yacht Transport has spent decades perfecting routes and shipping procedures to support our clients all over the world. From regularly scheduled voyages to custom made destinations, we haven’t met a request we couldn’t match. We handle every aspect of yacht shipping. This starts with consultations and learning more about what the client wants and where they intend to go, then building competitive estimates for their trip. From there we handle things like risk-insurance for the journey and how to prepare a vessel for the trip across the ocean. We follow all of this up with clearing customs and getting vessels to their destinations safe and sound. Curious as to why so many of our clients use us to ship their yachts? Here are our top three reasons to consider sending a vessel with United Yacht Transport. The Safety and Fear Factors – While some mega yachts can make it across oceans just fine, or our sailing friends can undoubtedly handle a trans-Atlantic (or similar) voyage, sometimes the weather or time of year just isn’t fitting for a cross-ocean trip. Not only is this kind of trip an exhausting one with weeks at sea, but it’s also somewhat dangerous if weather conditions aren’t in the vessel owner’s favor. 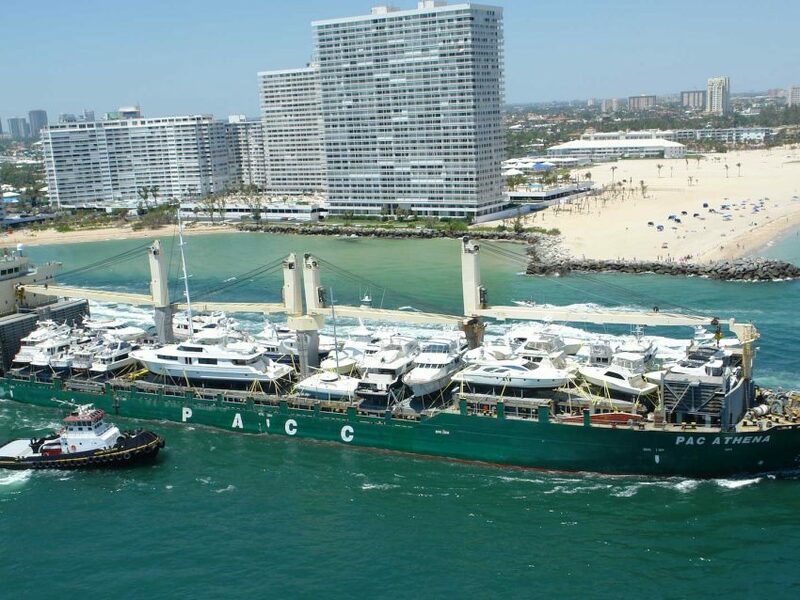 Rather than take risks, or if an owner is new to their yacht or boat ownership altogether, shipping a vessel takes the worry out of the equation. Explore New Destinations – One of the main reasons to consider shipping a vessel is to open up the world. The beauty of having a vessel is to be able to go to places that are harder to access or would take you months or years to see. Shipping a boat overseas is the best possible way to explore a new destination without the cross-ocean time it takes to get there. We have shipped vessels from Europe to Southeast Asia and even very remote areas of the Pacific and South American coasts. Logistics, Regulations, and Customs – The idea of provisioning for a trans-Atlantic trip can boggle the mind. Factor in the crew and sleep time tables, then the trip planning in electronic and paper maps, and then where to check in for clearing customs; well it’s a lot to consider. When working with a yacht shipping company, these factors disappear. Some argue this is part of the fun, but others don’t have the luxury of taking weeks to cross an ocean. That is where United Yacht Transport comes into the picture and handles the logistics. Our clients’ most significant decision will be figuring out what airline ticket to purchase to meet their boat on the other side of the trip. Excited to get your vessel moved across a major ocean? We can help. Call or connect with United Yacht Transport and let’s get your voyage planning started.